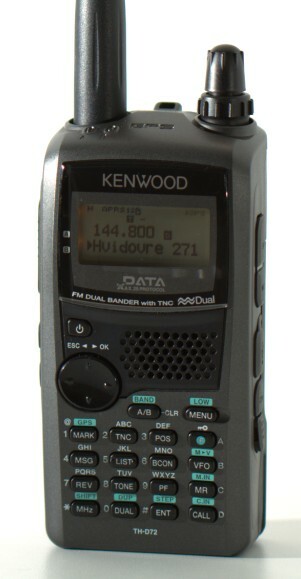 To celebrate that I got my HAM license back, I bought myself a new toy, a dual band 2m and 70cm Kenwood TH-D72. I have not been a active HAM operator for almost 20 years, but besides the complexity of the toys :) not much seem to have changed. Back then, I was playing around with ax.25 packet radio on 2m running at a whopping 1200 baud. Today, we are still using 1200 baud, but the Terminal Node Controller are now build into some high end handsets. Here in Denmark, there are not much old-school packet radio activity, but here in Copenhagen, I can hear lots of APRS traffic. APRS is build on top of the old ax.25 protocol, and is mostly used to report information about HAM's and there gadgets. All the APRS traffic is bounced around the network a bit, and the packages that manage to hit a internet gateway is then collected for anybody to study. One popular site that visualizes this traffic is APRS.fi. In an age where we all are carrying internet capable phones, it might seem strange to be fascinated by something as silly as 1200 baud data connections with limited range, but I'm enthralled but the openness of most of it. One thing that is not open, at all, is the radios we can buy, and even though we are allowed to build and use our own equipment, its hard to beat the size and features of the mass produces handsets that exists. This is also true for the D72, it has a USB interface that's used for firmware updates, GPS positions, packet radio TNC and configuring the radio, but unfortunately Kenwood have not documented most of the capabilities of the USB interface. My messing around a bit, I managed to find some commands, but I'm sure there are many more. I hope to find some time in the near future to see if I can't wrestle the firmware out of the D72 and take a closer look at what makes it tick, and discover some more commands, so that I can control the radio from linux.